Fans are petitioning CD Projekt Red to implement AMD’s TressFX Hair simulation technology, akin to HairWorks, in The Witcher 3. The petition was started following controversy around The Witcher 3 and the use of Nvidia’s HairWorks technology, which is part of Nvidia’s GameWorks developer program. The issue pivots around the very poor performance seen with HairWorks on AMD GPUs and Nvidia’s own non-Maxwell, Kepler based 700 series, 600 series and the older Fermi based GPUs. This recent controversy started just recently when Marcin Momot a spokesperson at CD Projekt Red, the developers behind The Witcher 3, stated that HairWorks, the previously mentioned hair and fur simulation effect from Nvidia’s GameWorks library “cannot be optimized for AMD products”. Here’s a quote of what he said. Many of you have asked us if AMD Radeon GPUs would be able to run NVIDIA’s HairWorks technology – the answer is yes! However, unsatisfactory performance may be experienced as the code of this feature cannot be optimized for AMD products. Radeon users are encouraged to disable NVIDIA HairWorks if the performance is below expectations. Following this statement PC gamers went on the offensive. Criticizing Nvidia’s GameWorks and the company’s game developer partnership program in general. Embodied in this lengthy post on the pcmasterrace subreddit, which has been upvoted over 4400 times in two days and has a 95% positive rating. We covered the history of Nvidia’s GameWorks program and outlined what various parties think of the program in detail in an article a week ago. We’d highly recommend that you go read that article if you want to learn more about why GameWorks garnered such a notorious reputation among gamers. We spoke with Nvidia’s head of PR for GameWorks, Brian Burke, and we’ll bring you an exclusive article about that very soon. Now that we discussed how this came to be, let’s discuss the present and the future. The petition which you can find here calls for a TressFX Hair implementation in The Witcher 3. 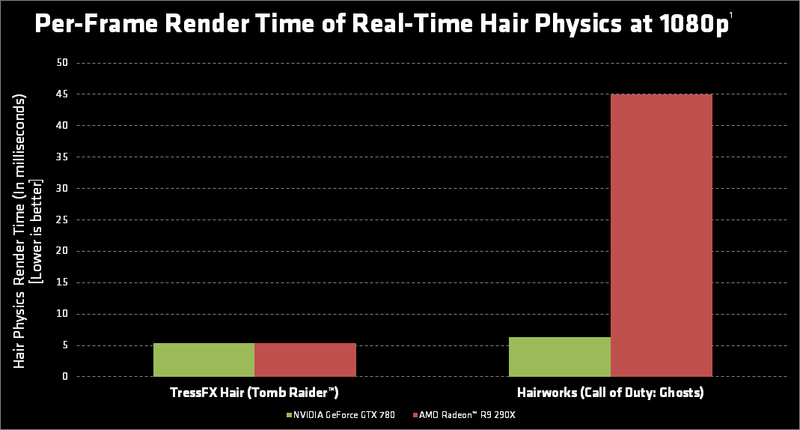 As we briefly mentioned above TressFX is a hair simulation technology which AMD debuted with the Tomb Raider reboot in 2013. The feature has come along way since 2013 and is actually in its third generation now dubbed TressFX Hair 3.0. The Dawn engine for the upcoming Deus Ex universe game, Mankind Divided, developed by Eidos Montreal will leverage TressFX Hair 3.0 throughout. Unlike HairWorks which is a middleware developed by Nvidia, AMD publishes the source code for TressFX on its website. And due to the open nature of this feature in comparison to HairWorks, AMD heralds TressFX as a superior alternative to HairWorks. Naturally implementing a feature directly into the game requires more work than simply using a middleware like HairWorks. But it also means game developers have absolute control over it and it can easily be optimized cross vendor. Something AMD has always been keen to point out. This has profound effects on performance. This, AMD points out, allows TressFX to perform equally well on hardware from either vendor. In comparison to HairWorks which the company claims runs 9 time slower on its hardware. Whats genuinely ironic is that TressFX actually runs faster than HairWorks on Nvidia’s own hardware too. Making TressFX a genuinely attractive option to hair and fur physics simulation. And essentially, this is why gamers are calling for its implementation in this petition.